EasyDose can record details of any third party institution (Payer), such as CentrePay and Prison Departments, who may pay for a patient’s dosing. 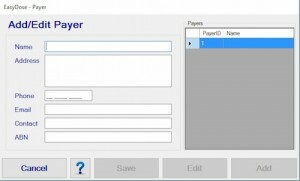 The details for the payer are recorded in the Payer form which then appear in the appropriate drop box in the Payment Form. 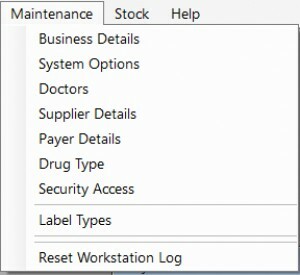 To access this form, the option must be turn on in System Options which will then allow the Payers option to appear in the Maintenance Menu. 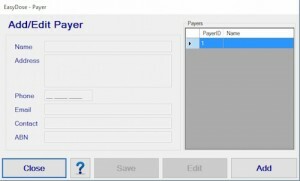 Click on Payers in the Menu to access the following form. To add a Payer, click ‘Add’. The form will unlock. When the details are correctly entered, Click ‘Save’ to retain the information entered. Repeat the process until all the Payer’s have been entered. As Payers are entered, the list on the right side of the page will expand in the form of a list. If a Payer adored needs to be edited, select the Payer in the list and click ‘Edit’. Modify the record and ‘Save’.